One tip to keep have your silk ribbon embroidery look good is to use crease free silk ribbons! In other words iron them. 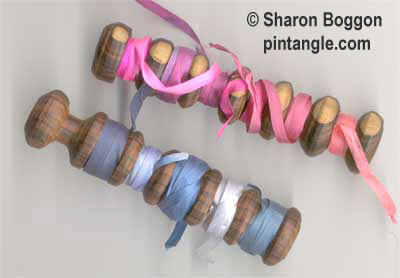 Now this is a fiddly and annoying task so I am often asked how I store my silk ribbon so that is does not get scrunched. I keep many of my ribbons on these hand turned wood ribbon holders. These are made by Jerry my husband. However my ribbon stash has been growing quicker than he has been able to stand at his lathe. So I decided I needed to come up with another solution. If you wind ribbons around something it will keep them crease free. Just about anything will do, for years I used the cardboard toilet roll innards to do the task! But I have been successfully using this method for a while now and I thought I would share it! Some people use the commercial thread bobbins to store their silk ribbon but this method has a problem as the commercial thread bobbins create a neat little crease ever inch or so as the ribbon is wrapped around the bobbin which is of course just what you do not want. However I think I have a solution as I realised that all they needed was a little ‘padding’ to take out the hard edge that makes the crease. This padding is a plastic straw. Get a plastic drinking straw. Measure the straw against the thread bobbin and cut the straw the length of the notch on the bobbin. 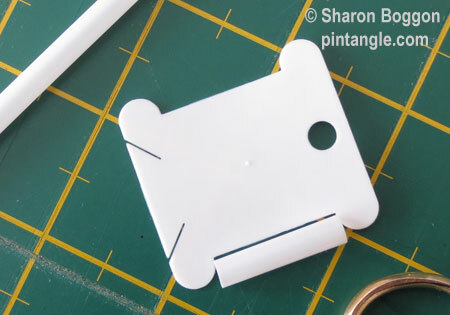 Do this twice so that you have one piece of straw for each side of your bobbin. 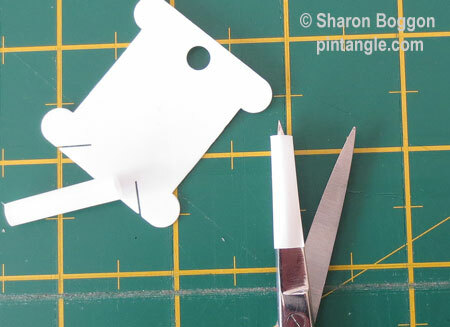 With old scissors (these are old embroidery scissors that are now used for other things) cut the straw open, up the side. 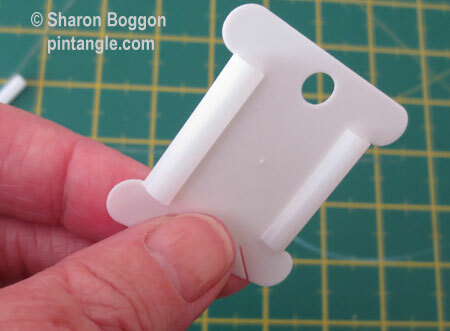 Slip the piece of straw over each side of the embroidery thread bobbin. The straw will stay on as it grips the bobbin. 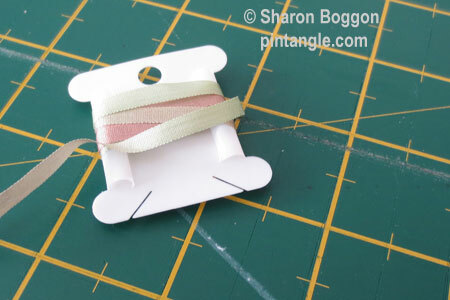 Wind your ribbon on not too tight and you will have no more creases! Friday freebies is a regular series in which I highlight free resources online, free patterns and links that are of interest to fiber folks. 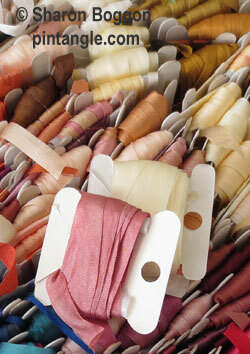 I’m starting a project that incudes silk ribbons. I was looking and looking for a way that I would/could accept storing them. This is it!!! Thank you so much. Catherine so pleased the tip was useful for you! An absolute moment of genius! Thank you!!!!! Clever, workable storage solutions for any collection of items are so helpful. A brilliant tip Sharon. I’m off to buy some straws and then this evening I will rewind all my ribbons. Merci pour le partage, je commence la broderie au ruban !!! Brilliant! When I told my Friday afternoon group about this, their mouths dropped open. We all wondered why we had never though of this ourselves! And that is the mark of a brilliant idea. Excellent idea; there are a lot of threads that would benefit from this treatment, too, if you take your threads out of the skein. What a great tip! I’ll soon be trying it out. Thanks for sharing this. Thank you so much for sharing this wonderful tip. I had been pondering a solution to my silk ribbon storage for some time. I had considered covering cardboard with batting to cushion the folds. I definitely like your idea better. Un grand partage de cette de géniale. Je vais le faire dès demain, car j’ai tout ce qu’il faut. Thanks Sharon this looks to be a really useful idea. This is a brilliant idea! Thank you! That is sooooooooooo clever and certainly a solution I can see I would use… THANK YOU!!! Sharon, I love all the embroidery, etc. tips you post, but this one is over the top! So simple and so effective. I will use the straws on my thread holders also. Thank you so much! What a FANTASTIC idea! I stopped storing my floss this way because of the creases (and now my floss drawer is an utter mess). This is just so simple and so smart, and what a wonderful stash of ribbon you have! A brilliant idea Sharon which I will be sharing with my friends. Thank you so much for putting it on here. This is one of those obvious answers that nobody ever thinks of. Thanks for the tip, Sharon! Thanks Sharon. Now that I am beginning to use more ribbon in my embroidery I was wondering how to store them; so this tip came at the most opportune moment. thank you for this tutorial; it’s a great idea!! Thank you, Sharon. How smart! This is the best piece of storage tip I’ve seen in a long time and just perfect for delicate ribbons. What a great idea! Thanks so much for sharing.